Saint Wulfran's father was an officer in the armies of Dagobert, a powerful King of the Francs. The Saint spent some years in the court of King Clotaire III and his mother, Saint Bathildes; but he occupied his heart only with God, despising worldly greatness as empty and dangerous, and daily advancing in virtue. He renounced the world and received sacred orders; his estate he bestowed on the Abbey of Fontenelle, or Saint Wandrille, in Normandy. He was nonetheless called to the court, where he served until his father died. Then, because the archbishop of Sens also had recently died, he was chosen in 682 to replace him, by the common consent of the clergy and people of that city. On the voyage by water, the deacon who served him at the altar, accidentally dropped the paten into the sea. Saint Wulfran told him to place his hand where it had fallen on the waves, and it came up to him by a miracle. For long years that paten was conserved in the monastery of Saint Wandrille. On this mission he baptized great multitudes, among them a son of their King, Radbod, and drew the people away from the barbarous custom of sacrificing human beings to idols. On a certain occasion, one such unfortunate, a young boy, had been selected by lot as the victim of a sacrifice to the gods, or demons of the land. Saint Wulfran earnestly begged his life of King Radbod, but the people ran tumultuously to the palace, and would not suffer what they called a sacrilege. After many words they consented, but on condition that Wulfran's God Himself save the victim's life. The Saint prayed God to resurrect him, and the child, after hanging on the gibbet two hours and being left for dead, fell to the ground by the breaking of the cord. The servant of God went to him and told him to stand, which he did, and he was given to the missionary. He later became a monk and priest at Fontenelle. 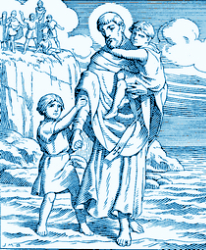 Saint Wulfran, after praying, also miraculously rescued a poor widow's two children, seven and five years old, from being drowned in honor of the idols; he walked out across the water in the sight of all the people, to take their hands and bring them back to land. The religion of Christ began to take root in this pagan land, and many were converted by these prodigies. He retired to Fontenelle that he might prepare himself for death, and expired in peace there on the 20th of March, 720. Reflection. In every age the Catholic Church is a missionary church. She has received the world for her inheritance, and in our own days many missionaries have watered with their blood the lands where they labored. Help the propagation of the faith by both alms and by prayers. You will strengthen your own faith and participate in the merits of the glorious apostolate. If they have called the Master of the house Beelzebub, how much more those of His household!